Limahl paints a pretty picture with "London for Christmas"
Radio Creme BruleeLimahl paints a pretty picture with "London for Christmas"
2012’s pop music scene was kicked into high gear fairly early in the year by a rather unexpected artist. Many know him as the charismatic frontman of New Wave band Kajagoogoo. He rose to fame in the early 80s with a handful of hits as part of Kajagoogoo (e.g. “Too Shy”) and also as a solo artist (i.e. “Neverending Story”). He is the one and only Limahl. Limahl returned earlier this year showcasing a rather different musical incarnation with his infectious dance-pop single “1983”. He had undoubtedly hit on a sound that allowed him to fit comfortably within the realms of modern pop music. One could not help but think that his follow-up single would be yet another dance single. The title of this post should quickly suggest that Limahl chose not to continue in the “dance pop” vein for his follow-up single. Instead, Limahl has opted for something a lot more down-tempo to celebrate a Christmas romance. It is difficult not to draw comparisons between the only two singles Limahl has released this year. While “1983” was an ode to that glorious year that put Limahl on the international music map, “London for Christmas” is an ode to the experience of Limahl enjoying Christmas in London exclusively with a special someone. Unlike “1983”, the new single features Limahl’s achingly beautiful voice drifting in a dreamy soundscape built only by a piano and lush strings. Christmas bells provide the occasional embellishment. This song is by no means standard “lightweight Adult Contemporary” fare. It has a beautiful crafted melody with a chorus that sticks. With “1983”, it became fairly obvious that Limahl has a knack for using lyrics to create a vivid imagery. On that single, he successfully captured the images and sounds that characterized the music scene of the early 80s through his lyrics while coating the song with a modern dance pop vibe. Limahl indulges his lyrical competency further on his new song by painting a pretty picture that is so quintessentially “London” as exemplified by the song’s first verse. The lyrics throughout the song are underscored by a sweet and youthful innocence. They are bound to resonate with anyone that has experienced a London romance during Christmas. For the non-Londoners, the inherent beauty of this track just might kindle a sense of longing to experience Christmas with a special someone – preferably in London. 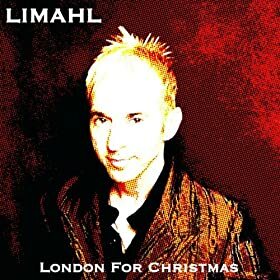 On “London for Christmas”, Limahl successfully marries a strong grasp for melody with a lyrical competency to romanticize our favorite time of the year. This song is an essential addition to your holiday soundtrack. It also proves that while Limahl’s commercial heyday may have been a little under 30 years ago, his artistic heyday is today. One can only hope that Limahl continues to make music for a very long time – however sporadic the releases might be. He is, without a doubt, one of the finest male vocalists making music today. If this review has triggered your curiosity enough, please go right ahead and download this beautiful musical gem right by CLICKING HERE. RADIO ALERT: Limahl’s “London for Christmas” is getting 5 plays a day on our radio station. IF you are reading this on a mobile device (smartphone, tablet etc. ), CLICK HERE to listen to our radio station. If not, listen to our station from ANY part of the world by clicking on the button below. 2 Responses to "Limahl paints a pretty picture with “London for Christmas”"
@Steve: Thanks so much for the comment. I really hope people like the single. We’re giving it about 4-5 plays a day so I know it won’t get “missed” by most of our listeners.